In Facebook news, they are rolling out the Facebook Creator app for people interested in video. They are now letting you collaborate in Stories for Facebook Groups and Events. Facebook wants to build a community of people creating or posting videos on Facebook. You're probably already using the latest Facebook Live video tools. To help you, they are launching the Facebook Creator App. With Creator, you'l get access to a Live creative kit - exclusive tools for personalizing your Facebook Live videos. When you start using the Facebook Creator app, you'll also become part of a community where you can connect with fans and collaborators from Facebook and Instagram. In addition, Facebook is adding crossposting of content to other platforms using camera effects along with the ability to use Facebook Stories to further engage with fans from within the Facebook Creator app. Lastly, you'll get Insights and analytics about your Page, the videos you post, as well as your fans. Besides all of this, Facebook is also launching a website for Creators. Here you can brush up on your video skills, join the community of like-minded people who love video and more. We've already signed up for the Facebook for Creators community. As a business owner, it might be useful if you're new to video because you'll get access to a what should be a great community so that as you use video more and more, you can repeatedly return to the community to get help from other Creators. You can read more the announcement about the Facebook Creator app here. Another new update this week from Facebook relates to Facebook Stories. People who use Facebook Groups and Facebook Events can now collaborate on Facebook Stories. When you add something to Facebook Stories for Groups or Events, the admin will moderate the content and it will become available to members. This is great news if you're a business and use Facebook Groups or Events to bring your customers together and build a strong community. For example, if you put on a wedding, meetings, parties or events, you no longer have to go looking for posts. Instead, you can have everyone contribute to Stories and then you can filter and approve them. Here is how collaborative Stories look. Here is how collaborative Facebook Stories work for Events. One important thing to remember about using collaborative Facebook Stories is that if you manage your own Group, the amount of work you might have to do might increase significantly, as more people post to Stories and you have to go and approve them. You can read more about collaborative Stories for Groups and Events here. This week, Facebook also rolled out Facebook Cover slideshows for Pages. You can already upload a cover photo to your Facebook Page as well as a video. Now you can add a Facebook cover slideshow as well. It's good to see that Facebook is offering different ways to customize your Facebook cover photo area. Some businesses don't have a lot of material, so they might use a single photo. Others might create a sizzle reel video about their business to further engage new fans of their Page. By adding a slideshow, you can now have a third option. With a Facebook cover slideshow, you simply go to upload a new cover photo. From there, you can choose slideshow and upload your cover photos - use the same size you currently use - 820 x 340 px overall and 820 x 312 pixels for desktop and 820 x 340 px for mobile. Here's what you should look for when adding a Facebook cover slideshow to your Facebook Page. Also this week, Facebook rolled out budget optimization for Facebook Ads. Previously, if you ran Facebook Ads, you had to make a lot of adjustments. In some cases, you would spend money on ads, only to have them go to the wrong campaign - the one that wasn't performing well. Fortunately, over the coming months, Facebook is rolling out budget optimization. The campaign budget optimization feature will let Facebook "distribute budget across ad sets to get the best results for your campaign." As a business, you know how important it is to prioritize every dollar. With the new campaign budge optimization, Facebook will distribute your ad budget across your ad sets so that you ca get best results fro your campaigns. Here is what that process used to look like and what it will look like now. You can read more about maximizing Facebook ad campaign reach here. In Twitter news, they have rolled out their $99 monthly subscription ad program to the public. Twitter is launching a $99 per monthly subscription ad program. With it, you get access to Twitter Promote Mode, which will automatically amplify your tweets and profile. When a tweet is amplified, Twitter will display a "promoted" badge, indicating it is an ad. As a business, you don't have to do anything except send out tweets. Tweets can also only be targeted to five specific interest or metro locations or regions in a specific country. Overall, we can think of a lot more we could spend $1,200 a year on to grow our business. Hopefully Twitter will add in more robust targeting options. One other thing you'll want to pay attention to is what you're tweeting. If you send a lot of tweets from other accounts, you could be driving your followers to other, better channels. To access Twitter Promote Mode, launch your Twitter mobile app and you'll find it by tapping on your profile photo. You can read more about Twitter Promote Mode here. Twitter is also expanding the number of characters for your display name. We're particularly excited about longer Twitter display names. Since our Founder, Christian Karasiewicz, joined Twitter, he could never put his full name in Twitter. As a result, everyone would call him Chris Karasiewicz. Fast forward to today and you can now have up to 50 characters in your Twitter display name. As a business, this shouldn't change much for you. You'll want to put your full business name that you use on your blog or other social media channels. This way when someone is searching for you, they find the correct accounts. There isn't anything you have to do to increase your Twitter display name. When you login, you'll be able to edit your settings and correct your display name if you need to now. You can read the announcement from Twitter about longer display names here. Also this week, Twitter has paused the verification process. It used to mean something when your Twitter account had a blue checkmark. Either you were a very important public figure, celebrity or athlete. Then everyone started to get then and they weren't special at all. This week, Twitter is pushing the pause button on verifications. This is very likely because they need to straighten out the process. It was supposed to mean something when you were verified. As everyone started to get them, they were no longer a symbol of someone important, but rather, someone who likely gamed the system to get a checkmark. Right now, as a business, you shouldn't worry about having a verified account. Enter your correct information as you normally would and go about your business. Twitter needs to fix the verification process and what it stands for. Go about your tweeting. When Twitter is ready to restart the Twitter verification process, you'll be ready to get verified - if you qualify at the time. To read more about changes to Twitters verification process, click here. In Instagram news, they are testing a feature to let you follow Instagram hashtags. Some of you might have seen the following screen options in your Instagram account. Some accounts are reporting the ability to search for a hashtag on Instagram and to then follow them - with no clear direction as to what that does. Of course, following a hashtag makes a lot of sense of ra number of reasons. For example, you can follow a hashtag to improve the content you see in your Instagram feed. Businesses who don't yet have their own hashtag might consider coming up with one and encouraging their customers to use it. By then following your own hashtag, you can see who posts about your business with that hashtag. This way you can learn more about your audience. To learn more about following hashtags on Instagram here. In LinkedIn news, they are making a lot of notable updates for generation leads through LinkedIn. This week, LinkedIn rolled out enhancements to Sponsored InMail and Dynamic Ad campaigns. This is great news for business owners because now you can begin to get more out of LinkedIn than considering your "digital rolodex." Here are the changes this week. Lead Gen Forms that are part of Sponsored InMail, will let brands ask a person for more information such as their name, email address, job title and company name. LinkedIn will use the information from that person's LinkedIn Profile to fill-in this information. Brands can then use this data from LinkedIn's Lead Gen Forms with the LinkedIn Campaign Manager self-serve tool or various third-party CRM systems. LinkedIn is also rolling out custom questions. These let you include up to three custom questions when businesses use Lead Gen Forms for Sponsored Content and Sponsored InMail. One last update this week is the ability to collect leads through Dynamic Ads campaigns. The way this will work is when businesses use Dynamic Ads to get people to download content - such as a white paper, they can require the person to send their name and email address if they opt-in. The good news about this update is that the person will be sending their primary email address that is part of their LinkedIn account. Overall, these are valuable updates for businesses because you can now get relevant information from a potential customer because it uses their account information - this should mean no more spam email addresses from users. You can read more about LinkedIn lead generation here. In Pinterest news, they are launching their own version of QR codes called Pincodes and this is what they look like. How many of you remember QR codes? They were they black and white squares you could scan with your mobile device. Unfortunately, they didn't really catch on. Pinterest though wants to change that with Pincodes, a reinvented version of the QR code. This change is part of Pinterest's larger update to visual search. With Pinterest pinches, users simply open the Pinterest app. From there, you can scan any pincodes they see. For example, you might find businesses using them in magazines, on retail tags and more. According to Pinterest, they are "targeted at brands and companies rather than consumers." To scan Pinterest pincodes, follow these instructions. When you scan Pinterest pincodes, you'll be able to access pins, boards and other ideas on Pinterest - no more screenshots of needing to take a picture. Pinterest is also planning to make pincodes available for people to follow your accounts. Right now, there is no word on how to generate Pinterest pinches. As a business owner though, you should be excited about all of the creative places you can put pincodes in your business and on your merchandise to drive customers back to related content curated on Pinterest collections. You can read more about Pinterest Pincodes here. The first tool that we have discovered this week is called Live Reacting (web). 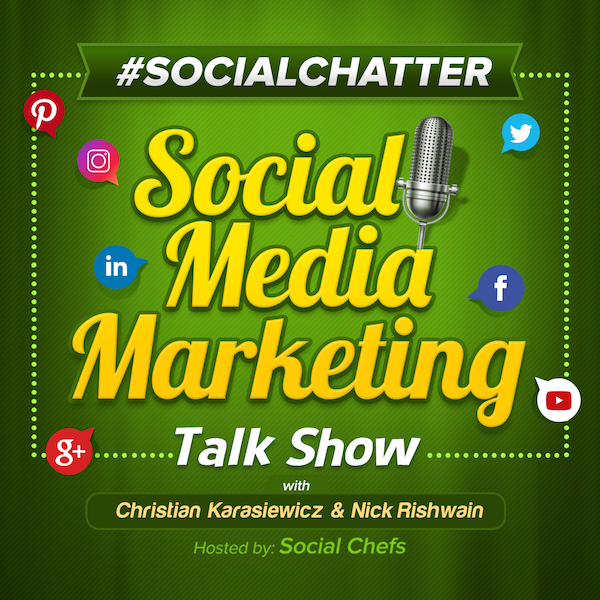 Would you like to create a more engaging Facebook Live show? Live Reacting is a tool for Facebook Live videos. With Live Reacting, you can create interactive polls that run during your show. They offer a number of different types of polls such as the ability to stream pre-recorded video, add a countdown timer, voting by Facebook reactions and more. If you're serious about creating a more engaging Facebook Live video show, Live Reacting is a must-have. Prices start at $0 and then range from $3.99 to $29.99 per month and more. You can try Live Reacting using the link below. The second tool that we have for you this week is called Pic Stitch (iOS). Would you like to share more creative collages on your Instagram channel? If so, try Pic Stitch. With Pic Stitch, you can create photo and video collages to help your posts stand out more. By using Pic Stitch, you can group together photos from specific events. If you're a retailer, you might want to create a photo collage for your Instagram channel that showcases an outfit and each of the individual items separately. Pic Stitch is a freemium app.